How many emails do you receive in a day? A week? A month? There is no doubt that whether you use email to stay in contact with friends and family, or to conduct business; email is an integral part of modern life. To help manage all those emails, contacts and appointments that keep us moving a million miles a minute, Microsoft offers Outlook. A cornerstone of the business world, many home and small business users also rely on Outlook to manage daily communication and scheduling. But what happens if you can’t find that important email from your aunt or the attachment your boss sent you to finish the month-end reports? You have a few manual recovery options, but if those fail, you should consider using third party software like ParetoLogic’s Data Recovery Pro or Stellar Outlook Repair to recover Outlook files. Can I Recover Lost Outlook Files Manually? Thankfully the answer is maybe. The first place to look for missing emails or attachments would be the trash folder in Outlook. If you can’t recover deleted Outlook email from the trash can, try looking in the recycle bin in Windows. If that proves fruitless you can try to restore deleted email by using Windows search. To accomplish this, you should conduct a general search based upon the subject of the email or unique words you know for certain that are contained within the email. If you’re looking for the attachment, knowing the name of the attachment will increase the likelihood of being able to restore deleted email and attachments. Is Your PST File Deleted, Lost, or Missing? In the case you cannot actually locate the PST file, you will need specialized software to get it back. 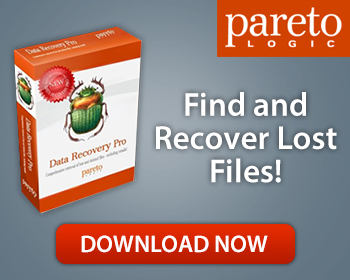 I recommend downloading and scanning your system with ParetoLogic’s Data Recovery Pro in order to recover it. This software searches on the lower levels of your hard drive to recover files and data you wouldn’t normally be able to access on your own. Need To Recover Or Repair a Corrupted PST File? For when you have the actual PST file but it is corrupted and you cannot access it, I recommend using Stellar Outlook Repair. This will help you recover emails, email attachments, contacts and other Outlook files even through the PST file has been corrupted or will not open. Your computer is constantly writing information to the hard drive. Because the lost file you are trying to recover could be overwritten at any time; stop using the computer immediately! Proceed to download ParetoLogic’s Data Recovery Pro for lost or deleted PST files, while download Stellar Outlook Repair can help you repair corrupted PST files. After you’ve installed the program, use it’s simple interface to harness the powerful search algorithms to help you restore your Outlook files. With so much of your daily work and personal life being run through Outlook, it makes sense to have the tools to restore Outlook files that go missing. ParetoLogic’s Data Recovery Pro and Stellar Outlook Repair are the perfect applications to recover lost emails, attachments, contacts, and other Outlook files.